This control is Bootstrap 3 only. Use Card in Bootstrap 4. While not always necessary, sometimes you need to put your DOM in a box. For those situations, try the panel component. 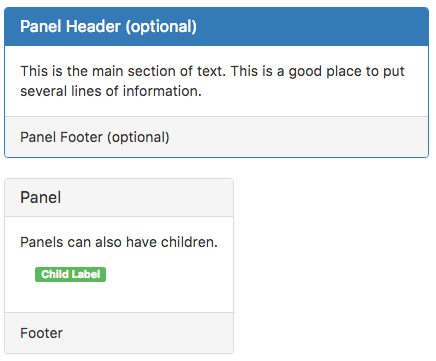 If you change the contents of the header, value or footer at runtime, any children (including Badges) will be affected. It can also act as a container for child controls. appearance Appearance of the control. Can be default, primary, success, info, warning, danger. badge Adds a Badge to the control. Design Time and Runtime. footer The text on the bottom. Leave blank for none. Design Time and Runtime. header The heading in the control. Leave blank for none. Design Time and Runtime. position How will the children be positioned? absolute, fixed, relative or static. value The text in the center of the control. Leave blank for none. Design Time and Runtime. None - this is a passive control which simply displays. This page was last edited on 2 February 2019, at 14:22.